Sean Kendrick knows too well the risks of the race. As a boy, he watched his father murdered by the violent water horses during the Scorpio Race. Sean isn’t too worried – he’s won before and he will win again. He intends to win freedom for himself and the horse who means more to him than anything. The race brings Sean and Puck into one another’s lives as uneasy and unlikely allies. As their friendship begins to deepen, both know one simple, terrible truth: there can be only one winner to the Scorpio Races. From the very first page, Stiefvater immerses readers in the tumultuous world of Thisby Island with its mythic history, charming towns and haunting cliffs. The story unfolds through lyrical, emotionally charged prose, introducing the desperate and headstrong Puck, her brothers and her beloved island pony. Opposite Puck, we find Sean Kendrick, a renowned horse trainer and thoughtful/silent type. The American buyer who follows Sean around works as a great foil to add humor and lightness to Sean’s reclusive nature. Many of the islanders attend a Catholic church. Puck visits Father Mooneyhan to confess her sins. There are other references to things like whether playing cards or getting angry is a sin. The water horses also have a lot of lore and magic surrounding them. Riders use charms like bits of iron and bells to try to control them. The water horses are deadly and unpredictable. Puck and her brother discover several animals that have been mutilated and killed by the capaill uisce. Puck is attacked and threatened by them. Several islanders are killed by the water horses. 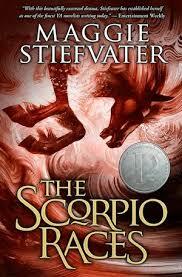 Tagged Horse Races, Maggie Stiefvater, Scholastic Press, The Scorpio Races. Bookmark the permalink.